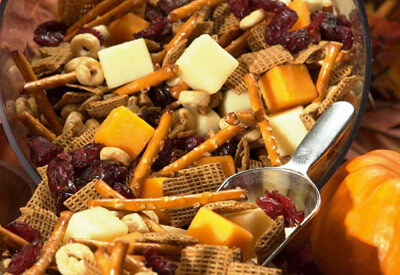 Kick up the calcium with this make-your-own snack mix! Mix cereals, pretzel sticks and sunflower seed kernels in large bowl; set aside. Melt butter in small saucepan over medium heat; stir in oil, water and sugar. Bring to a boil, stirring occasionally. Remove from heat; stir in cinnamon and mix well. Pour over cereal mixture; stir until evenly coated. Spread into 9x13- inch baking pan. Bake 20 minutes, stirring after 10 minutes (be careful not to overcook). Spread on waxed paper or aluminum foil; cool completely. Toss with dried cranberries; store in an airtight container until ready to serve. Toss in cheese cubes just before serving.